Star Junction, as viewed from the center of the district towards the south; the skyline of neighboring Triangle is seen further in the background. Where the bright lights of Capitalism blink 24 hours a day. A great place to go if you like advertising. Star Junction is a district in the borough of Algonquin in Liberty City featured in Grand Theft Auto IV and Grand Theft Auto: Chinatown Wars. Its real-life archetype is Times Square, New York City. Star Junction is bordered by Middle Park to the north by Nickel Street and The Triangle to the south by Kunzite Street. The Meat Quarter, Westminster and Purgatory are on its western borders by Frankfort Avenue, while Hatton Gardens, Lancet and Easton sit on its eastern borders by Columbus Avenue. Along with the Middle Park, and The Triangle it is one of the main neighborhoods in Algonquin and Liberty City. The entire district is designed with the commercial intersection at the center that features a diagonally placed road, Burlesque, that run from the northwest at Manganese Street to the southeast at Garnet Street in neighboring Triangle, cutting across Denver-Exeter Avenue and Kunzite Street and making up one of Algonquin's main attractions. While seemingly depicted as one, the cityscape is in fact located in both Star Junction and neighboring Triangle, which takes up the southern end of the area. Star Junction is intended to mimic the functions of New York City's Times Square as both a cultural and corporate center of the city. Star Junction's urban design is characterized by heavily ad-laden buildings and entertainment establishments in the center surrounded by less "decorated" apartments, hotels and officer towers to the north, east and west. Its intended function also results in the presence of "Broadway" theaters and other entertainment establishments (including the Split Sides) which show different performances. 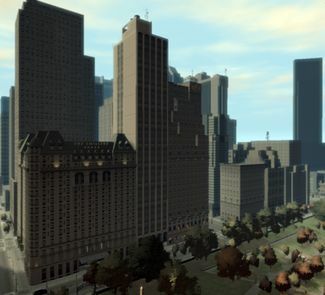 The northern edge of Star Junction that borders Middle Park is designed to mimic a more homely skyline of older hotels lined along real-life Central Park South, implying Nickel Street is the in-game equivalent of 59th Street. Needless to say, Star Junction is a spectacular location to visit at night, rivalled only by The Strip and Old Venturas Strip in Grand Theft Auto: San Andreas for its lights and spectacle, and is worth exploring on foot at some point in the game. While most districts in Liberty City are generally not strictly adherent to the design of their real life counterpart, Star Junction's is more accurate in layout as Times Square, placing in-game renditions of Time Square's landmarks as accurately as possible. Landmarks based on those in the southern end of Times Square are in fact located in neighboring Triangle. 1 Times Square. The building is situated in Triangle. 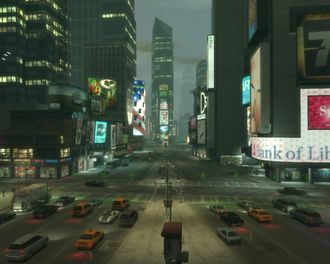 2 Times Square/704-720 7th Avenue (Ramada Renaissance Times Square), depicted in game as one of two Libertine Hotels in the city, the other located in Lancaster. The Star Junction hotel is implied by its five stars to be a five star hotel. 7 Times Square (Times Square Tower) . While forming part of the Star Junction skyline, the building is situated in Triangle. Duffy Square, specifically the Father Francis D. Duffy Monument. Small police station in the middle of Star Junction. A police car is seen in the foreground. A LCPD sub-station located right in the middle of Star Junction is similar in design to the Times Square Police Station. The building is situated in Triangle. 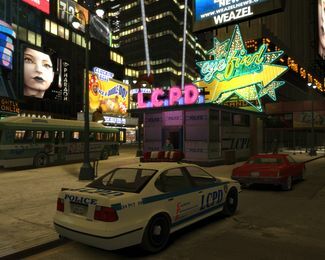 Just north of the LCPD sub-station is an LC Services Recruiting Center, the game's equivalent of Time Square's United States armed forces recruiting station. As oppose to the real-life rendition's association with the military (including the Army, Navy, Air Force and Marines), the in-game rendition is linked to civic services (including the "LCPD", "LCFD", "DOA" and "COLP"). 1605 Broadway (Crowne Plaza Hotel), depicted in game as The Star Plaza Hotel. 1585 Broadway (Morgan Stanley Building). The in-game rendition features a corner street level signage bearing "Cooper Jackson" naming, similar to the Morgan Stanley name, as well as the manner in which the name is rendered on the real-life building's sign. Like its real-life counterpart, the in-game depiction features several rolling stock tickers. The building's design and textures are partially reused for another similar building to the north. 1567-1569 Broadway (W Times Square), depicted in game as the Celtica Hotel. 1535 Broadway (Marriott Marquis Hotel), depicted in game as Hotel Uberbrucker. 1501 Broadway (Paramount Building) . The in-game rendition houses Canyon Entertainment, a Superstar Café and an unspecified Superstar venue advertising a Love Fist gig (mimicking Paramount Theatre, which the Paramount Building houses in real-life); the building also sports a functional rooftop clock. While forming part of the Star Junction skyline, the building is in fact situated in Triangle. 1568 Broadway (Doubletree Guest Suites/Embassy Suites Times Square), depicted in game as the Banner Hotel & Spa. The game's renditions appears to integrate some of the tower's feature but opts for a more simple symmetrical design. In addition, the orientation of the building relative to the streets differs to that in real life. The Seagull Theater is also integrated into the building, adopting more traditional street-level brick facades of the real-life building. 1540 Broadway (Bertelsmann Building). The in-game rendition houses a "Thespian Theaters", which entrance is used as a venue for Pathos. 1500 Broadway (Times Square Studios) , prominently featuring a curvy FlyUS LCD display, tickers, and housing a Cluckin' Bell restaurant. While forming part of the Star Junction skyline, the building is in fact situated in Triangle. 1 Astor Plaza, which, in real-life, is occupied by MTV Studios on the second floor. The in-game replication of the building houses a similar establishment for MeTV, a play of MTV, as well as a "MeTV Theater", and a spinning turntable prop on the side of the building. The building has a helipad on the top, which occasionally spawns a Maverick, accessible via a window cleaner lift at its western face. One of the 200 flying rats can also be found there. Rockefeller Center : The in-game rendition features replicas of four Rockefeller Center buildings, including 30 Rockefeller Plaza (GE Building), 630 Fifth Avenue (International Building), 1260 & 1270 Avenue of the Americas (Radio City Music Hall, depicted in game as the Live Central Music Venue, and the American Metal Climax (AMAX) Building/former RKO Building, respectively), and a low-rise building based on either 610 Fifth Avenue (La Maison Francaise) or 620 Fifth Avenue (British Empire Building). The building complex is centered around a sunken plaza, similar to the Rockefeller Center's grand plaza, with only a fountain and flagpoles as decors. 209 West 42nd Street (New Victory Theater), depicted in game as the Liberteen. 214 West 42nd Street (New Amsterdam Theatre), depicted in game as the Maginot Theater. Although the building housing the theatre is identical to its real-life counterpart, the theatre street level signage is very dissimilar to the New Amsterdam Theatre's distinctive "AMSTERDAM" sign. The building is in fact situated in Triangle. 226 West 46th Street (Richard Rodgers Theatre), depicted in game as The Magic Curtain. The game rendition is longer than the real life counterpart, having five arches along its facade instead of three. Skyline of Star Junction's northern fringe at Nickel Street, as viewed to the southwest. The Emissary and The Majestic are pictured. AMC Empire 25  , depicted in game as the Amdram Theater. Whereas AMC Empire 25 has been modernized and expanded with only the front of the AMC Empire 25's original frontal facade still standing, the Amdram Theater is depicted as an independent building. The building is situated in the Triangle. 220 42nd Street and 221 41st Street  (Candler Building). The in-game rendition houses a Wigwam Burger outlet at the lowest floor, mirroring the McDonald's outlet in the same building. The building is located in the Triangle. 1522-1524 Broadway & 46th Street (I. Miller Building). Located at Kunzite Street between Denver-Exeter Avenue/Burlesque and Columbus Avenue, the in-game rendition is significantly shorter in length, and features only the "DEDICATED TO BEAUTY" portion of the I. Miller Building's "THE SHOW FOLKS SHOE SHOP DEDICATED TO BEAUTY IN FOOTWEAR" engraving below the crown. The building is occupied by an Out of Towner restaurant (coincidentally, the real-life building houses a T.G.I. Friday's). The Plaza Hotel, depicted in game as The Emissary, which rooftop sign is lined by five stars below, implying it is a five star hotel. Its size has been reduced. 50 Central Park South (Ritz-Carlton New York, Central Park/former St. Moritz Hotel) , depicted in game as the Majestic Hotel (the structure is slightly smaller) and located at the same block as The Emissary. It also is located on the same block as a building based on 35 Central Park South, the Helmsley Park Lane. The block is a simplification of the block all three buildings exist on in real-life. Liberty City's comedy club, the Split Sides, hosts comedy acts with Ricky Gervais and Katt Williams. Due to its concentration of skyscrapers in Algonquin, Star Junction is also a hotbed for Base Jumping in The Ballad of Gay Tony. The nearby subway stations are Frankfort Station and Easton Station on all major lines. Buses often spawn by the side curbs around Star Junction and The Triangle or various times can be seen driving around these areas. Alternate view of Star Junction, as viewed from the northern edge of Triangle towards the north. A statue at the northern end of Star Junction's junction, similar but not strictly adherent to the real-life Father Francis D. Duffy Monument in Times Square. Star Junction Cluckin' Bell (technically located in Triangle). A spoof of the Rockefeller Center on the northeastern end of Star Junction. Live Central Music Venue on the southeastern corner of the aforementioned Rockefeller Center replica. Bedford Point, a similarly designed district in the preceding rendition of Liberty City. This page was last modified on 26 August 2012, at 04:35.